The Barrister's Block is a four patch that is a little more work than many quilt blocks, and so I have labelled the block as an intermediate level of difficulty. There is nothing challenging in making the patches -- there are just lots of them. With the exception of four squares, the block is comprised entirely of half square triangles, in two different sizes. So, once you have the construction of those patches down pat, you are off on your way. I chose to make this block as a "scrappy" version, just because scrappy quilts have always been my favourites. But you can choose to use a single fabric for all of the dark patches if you desire. It's entirely up to you. 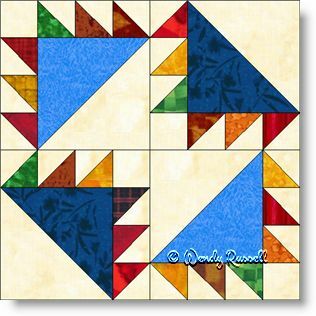 The sample quilts illustrated show how secondary patterns emerge when you start to rotate some of the blocks. Adding the sashing between the blocks on the quilt set on point gives an additional feature of interest. What can you come up with?